Anyhoo, how was your weekend, everyone? Punk was one of the biggest stories in fashion in the 1970s. Born out of a relatively short-lived anti-fashion street cult, it ended up representing some of the most pivotal ideas of its time through its notoriety, its similarity to tribal intimidation techniques, and its political stance. These pics were taken before Christmas, but for some reason, I never got the chance to post them. I like this kind of outfit just because I've always loved the concept of short over long:) I blame all those images from thesartorialist.com! What do you guys think? Have you done the short-over-long layering? Here are the rules for the award: 1. Thank your Liebster Blog Award presenter on your blog. 2. Link back to the blogger who awarded you. 3. Copy & paste the blog award on your blog. 4. Reveal your 5 blog picks with under 200 followers. (I'm assuming on GFC.) 5. Let them know you chose them by leaving a comment on their blog. Wishing everyone an amazing Year of the Dragon! These are my new fave accessories, as the cold winter weather has come with a vengeance where I am. No more mild temperatures...Bah! Anyhoo, bought these on sale at Urban Outfitters awhile back, and they got buried under the crap in my closet. I remember as a youngling buying cheap gloves from the dollar store and cutting off the ends...heehee...now, I don't have to do that! It's red...it's studded...it's faux leather. What more can a girl ask? If there is a fashion-related job that I would kill to have, it would probably be costume designer for a film or TV show. I think this job would best combine what I love in the world:fashion, celebrities and research:P. A character (to me) on screen is not only defined by what s/he does, but also by what s/he wears. On that note, one of the most beloved characters on film whose fashion I truly loved is Gib from the film The Sure Thing. 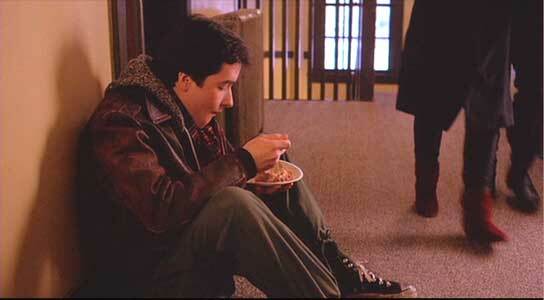 There's nothing better than John Cusack in the 80's, and Gib is (I think) of the best slacker heroes out here. His uniform of a beat-up leather jacket, military pants and Converse sneakers defined his character, and they still look great even now. Kudos to the costume designer Durinda Wood for an awesome job on this. What's up with your pants? People always think I'm wearing pyjamas when I wear these pants, which make me want to wear them even more...bwahaha! I know the holiday season is over, but I just could not get enough of sparkly stuff....hence, the obsession over the sequin pants. If I can get away with wearing the same thing over and over everyday (a la Einstein), this outfit would probably be it. Everything (from top to bottom)is just so comfy. I can wear this going shopping, to a casual dinner, or even to church. Do you guys have a certain outfit you want to wear all the time?